Judge Dredd is a fairly well-known character, some know him from comics and others from the film. In this tutorial, we want to show you how to draw Judge Dredd step by step. All drawing tutorials about people must begin with the skeleton of the character, and the Dredd lesson is no exception. We start from the head, then the line of the spine, on which the chest and pelvis are sketched out. By simple lines we sketch out the arms and legs. Try not to press too hard on the pencil. Now we draw two simple lines on the face of Judge Dredd, which will help us further outline the details of the face. Next, the outlines of the neck and torso, which expands at the shoulders and tapers at the waist. Next is the time of arms and legs, which must be sketched with very light and simple geometric figures. 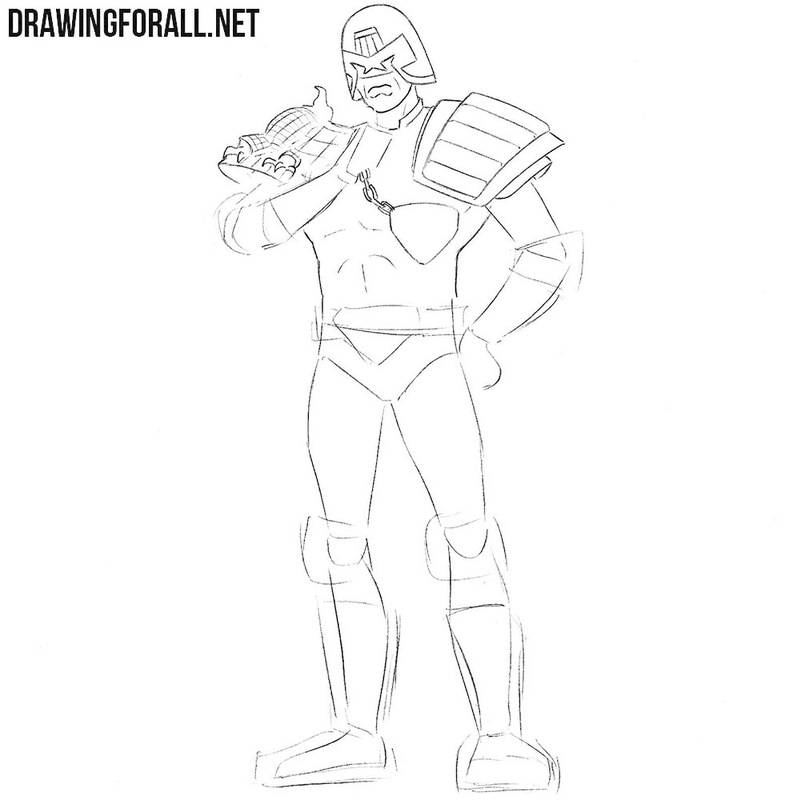 In the step number three, we will draw the most basic details of Dredd. 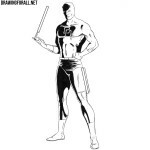 Starting from the head, we sketch out the outlines of the helmet and the mouth of the Judge. 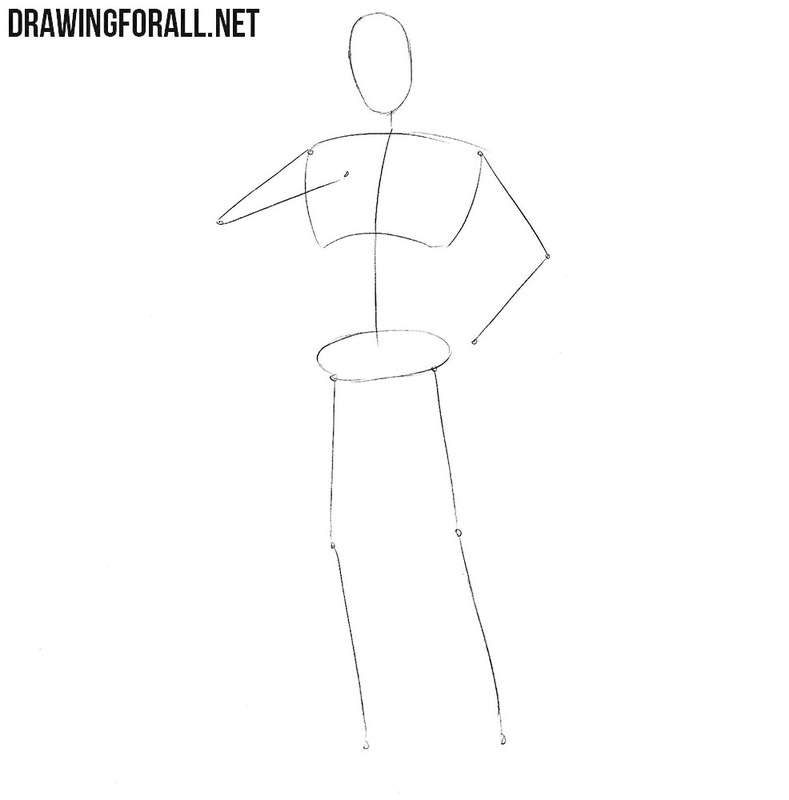 Next, go to the body, sketching the outlines of the costume, as shown in the example below. All lines of the first, second and third steps should be very light. So, now we take either a darker pencil or a marker and carefully draw the outlines of the helmet. Next we need to draw the outlines of the mouth and jaw. Outline the details on the helmet and add some wrinkles to the face. Now take an eraser and remove all unnecessary guidelines from the face. 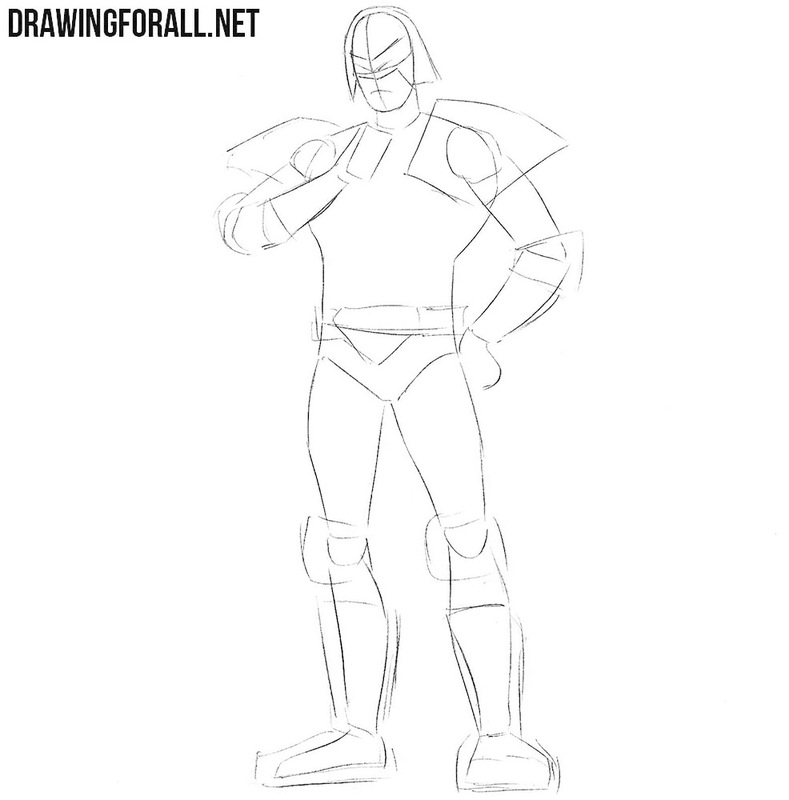 This step of the tutorial on how to draw Judge Dredd will be quite difficult, because there will be a lot of complex lines. First of all, let’s carefully draw out the outlines and details of the shoulder pads. 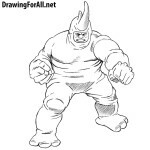 Next, go to the torso, gently drawing it as in the example below. Another very difficult step in which we will draw the arms of Judge Dredd. Be especially careful when drawing the elbow pads and gloves. Also try to draw the hands as carefully as possible. In the same step we delete from the arms all unnecessary guidelines drawn in the first steps. Carefully draw out the belt with pockets and a large logo in the center. Next, draw the outlines of the legs, taking into account the lines of all muscles and joints. Further we draw elbow pads and big shoes. 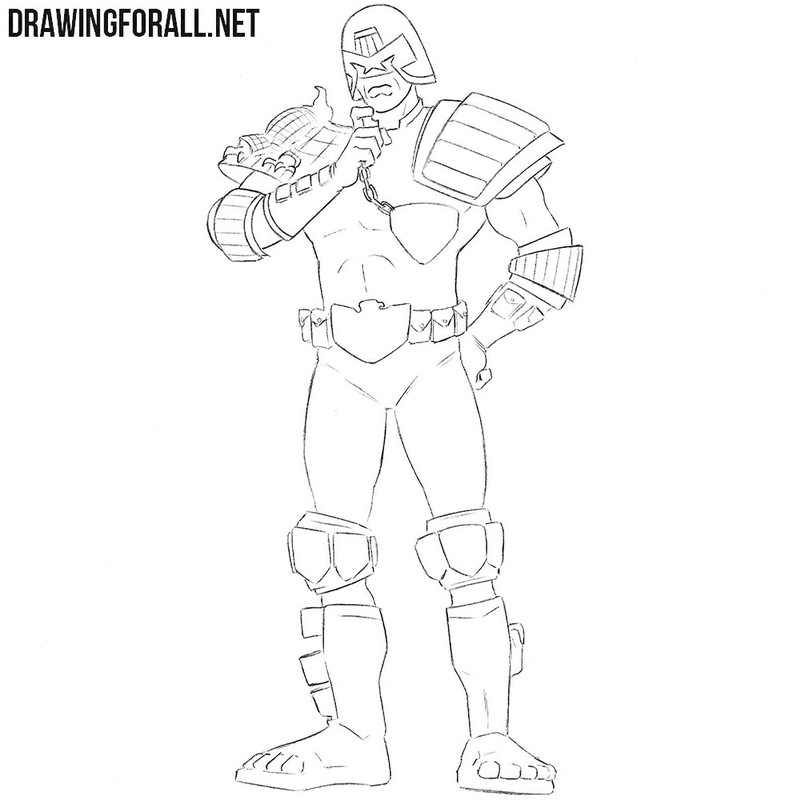 We remove all the unnecessary guidelines from the drawing, to make our Judge Dredd more clean and neat. The lesson on how to draw Judge Dredd is almost complete, we just have to add some shadows. To begin, determine the light source. Next, with this in mind, we carefully draw the shadows using dense hatching. 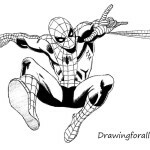 If you want to make the shadows darker, then just add another layer of hatching. 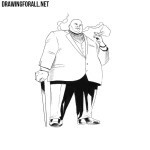 We really like characters like Judge Dredd, and we want tocreate as many similar drawing lessons for you as possible, so be sure to visit our site as often as possible so as not to miss the new cool drawing lessons by drawingforall.net.